BeePilot is a an interactive demonstration showing some basic principles of bee vision. A participant is put into a virtual environment which they view though an accurate model of a honeybees visual system. 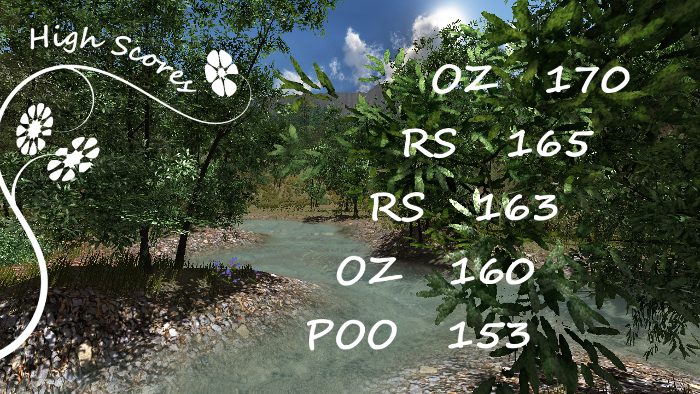 When used as a demonstration simulation is run as a game where one participant uses the virtual reality headset and tries to find as many flowers as possible in a given time period. Onlookers are encouraged to direct the person controlling the bee. 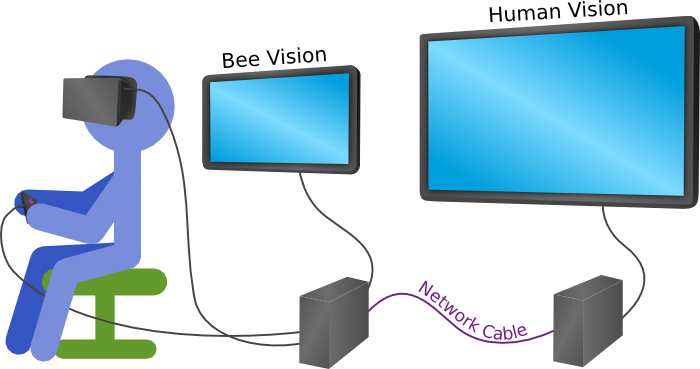 This emphasizes the difficulties a bee faces in using vision to guide her behavior, and her need to rely on other information sources. The software may be downloaded below, as are details needed for setting up and running the demonstration yourself. 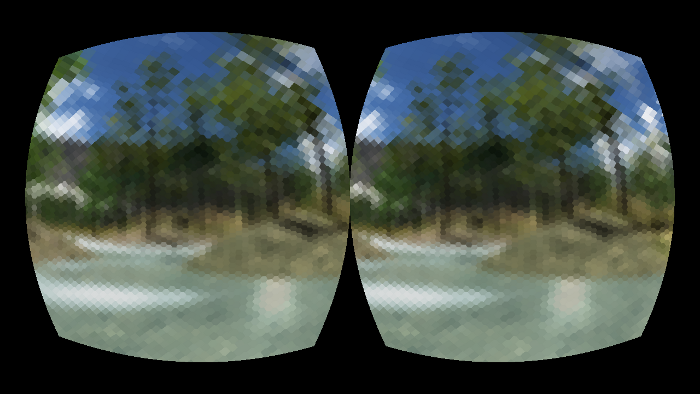 This image shows the data sent to each side of the virtual reality headset. You can see that the resolution of bee vision is greater along the horizon. This image shows the level of detail seen by the people not controlling the bee. It also shows what happens when you let children write three letter names on a high-score table. BeePilot is released under a Creative Commons licence and may be downloaded below. Equipment list: BeePilot requires two networked Windows x64 desktop computers, two screens and one Oculus Rift virtual reality head set. It is recommended to have a game pad controller and a set of speakers. Graphics Cards: The graphics of BeePilot is relatively intensive, it is a good idea to use a computer with a dedicated graphics card. The card must have the correct drivers installed (if not, the simulation will crash). Networking: The two computers must be networked, either directly or though a LAN. The port 1664 must be available. The computer running the Oculus must have the correct IP address set in the blue startup screen. This screen also displays the IP address of the computer the software is running on. Controllers: Many different game controllers are compatible with bee pilot, however, most must be configured in the 'input' tab of the first screen. Non game pad inputs can be configured here too. Sound: Speakers are required so that on collecting flowers a buzzing noise noise may be heard. This feedback makes the game component of the exercised much more understandable. Oculus: The Oculus is reset every time a new scene starts, this means the user should be facing forwards at the start for an optimal experience. Scoring and Time: Both the 'big screen' and 'Oculus' instances have options for setting the time and resetting the scores. The time must be set on the 'Oculus' instance and high scores are recorded (and reset) on the 'big screen' instance. Windows Security and Unity3D: The first time the game is run on a machine, Windows will usually require authentication by the user. Due to a bug in Unity3D (used to create the game), this minimizes the simulation window and it cannot be re-maximized. Simply kill the process with the task manager and restart it. Wolfgang Stuerzl provided me with the data describing the honeybee eye geometry. Andrew Woolley created the bee-pilot logo. Thomas Nowotny for his organization and making this possible. Sussex University for financing this project under their Widening Participation scheme. Michael Mangan at the Institute of Perception, Behaviour and Action for lending me a UV camera for my preliminary research. BeePilot is licensed under a Creative Commons Attribution-NoDerivatives 4.0 International License.